Purple, purple, purple. It’s been all over the runways and now it’s hit SUR LA TABLE. 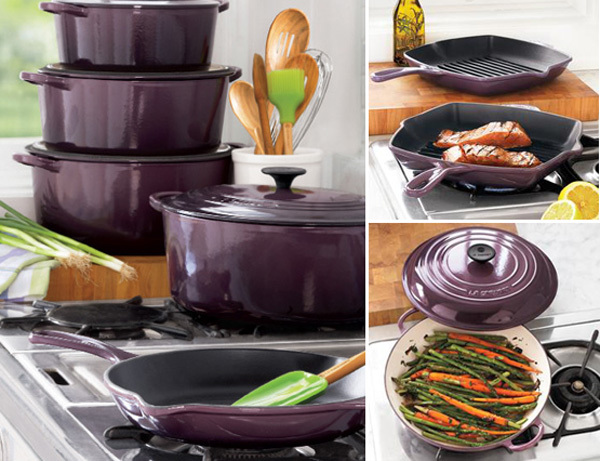 They’ve partnered with LE CREUSET for a collection of two exclusive colors — lilac and cassis (dark purple). Apparently, color does matter. This might actually push me over the Le Creuset hump and get me to invest in my first piece. Pan features high ridges, lifting food above collected fat for healthier cooking while creating signature grill marks to give meat and veggies that appetizing appearance. Handles are designed for added comfort, balance and ease of lifting. Made in France. 10¼”. Perfect for braising meats, simmering stews and preparing short ribs. Angled sides allow easy stirring and basting. Safe for stovetop, oven and broiler. Dishwasher safe. Made in France. 3.5 qt.